ED is designed mainly for desalination, so if you’re using RO to remove suspended solids, total organic carbon (TOC), or other contaminants, you can stop reading now (I suppose) and stick with RO. There are many applications, however, particularly in the industrial space, where brackish water desalination is integral to operations. It is also being used increasingly to supplement dwindling available resources and mitigate saltwater intrusion of aquifers. Historically cost-prohibitive, electrodialysis is now viable alternative to reverse osmosis — maybe even a better one. What follows are the benefits of ED in comparison to RO, since the latter is the current standard. They were shared by Pat Buzzell of Evoqua Water Technologies, which has been performing extensive R&D on ED technology since 2008 in its (successful) attempt to make the electrochemical desalination via electrodialysis feasible for widespread adoption. The benefits were always there for ED, going back to its inception a half-century ago, but greater affordability casts these advantages in a new light. What does it mean to be tunable? In the context of desalination, it means the ability to change the input and output easily. ED has it; RO doesn’t. “We've actually piloted on some sites that are ocean-driven, brackish water areas, with 2,000 ppm during outgoing tide and perhaps 35,000 ppm during incoming tide. That's quite a swing from the standpoint of TDS. All we do from an ED standpoint is increase the amount of power that's necessary to drive those salts out of the solution,” explained Buzzell. With ED, water quality is not affected by reducing energy. Whatever energy that isn’t needed is saved, but output is consistent. With RO, consistent water quality is dependent on a certain (high) pressure to pump and filter feed water through tiny membrane pores, regardless of how much salt is being removed. Whereas RO is dependent on high pressure for its membrane treatment, ED works by cross-flow separation using ion exchange (IX) membranes, which is a low-pressure/tangential flow process. As opposed to the brute force of RO filtration, ED operates quietly and doesn’t require specialized piping, valves, and pumps to accommodate RO’s intense pressure. Though they may change over time, capital costs and energy are easy to calculate and compare; O&M costs are harder to evaluate. Buzzell contended that because RO requires more equipment operating in a severe environment, ED earns an advantage with regard to long-term O&M. Not just less expensive, but also simpler. Since there is no need to consider lost capacity, CIP schedules are easy to maintain with ED. Plus, the physical maintenance is “a bit easier overall,” according to Buzzell. Finally, the tunability of ED allows operators to run at higher power and reduce their physical footprint; or, conversely, to increase the number of modules and keep energy consumption low. Such flexibility is most advantageous where footprint or energy is an especially expensive commodity — for example, the premium price for space aboard offshore ships and platforms. If both time and space equal money, the last two benefits speak to the cost savings that “tunability” brings to bear. 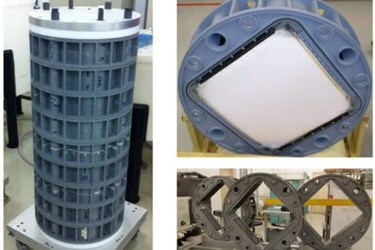 Credit for bringing the cost of ED down is attributable to a new ion exchange membrane developed by Evoqua and incorporated into its NEXED electrochemical desalination modules. Buzzell informed me that the membrane not only breaks cost barriers, but also improves on the design and performance of any previous IX membrane. It may even be utilized for seawater desalination in coming years, but that isn’t the company’s current focus (though an exciting prospect). For now, Evoqua’s ED revival is centered on particular brackish water applications — 2,000 to 15,000 ppm, mainly industrial — where the above-listed benefits can outshine RO. Opportunities for the future will hinge on how the technology performs in this first phase, and there’s no better place to determine ‘bang for the buck’ than the private sector.